PULASKI – Governor Terry McAuliffe today announced that Grupo Phoenix, a manufacturer of rigid packaging containers for the global food and beverage industry, will invest $48.7 million to expand its subsidiary manufacturing operation, Phoenix Packaging Operations, LLC, in Pulaski County. 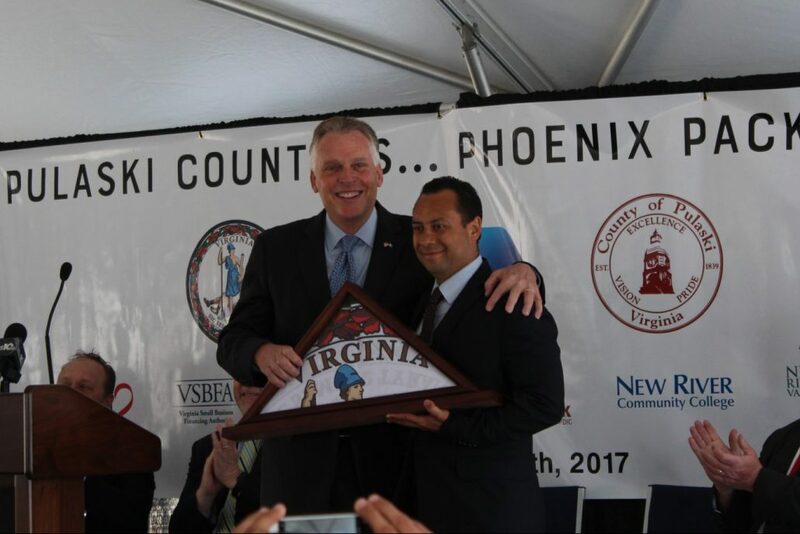 Virginia successfully competed against Arizona and Mexico for the project, which will create 145 new jobs. Governor McAuliffe and other Virginia officials met with the Grupo Phoenix leadership during an August 2016 trade and marketing mission to Colombia. Grupo Phoenix established its first U.S. manufacturing facility in Pulaski County in 2010. This project represents the company’s third expansion, bringing its investment in the operation to $106.2 million and a total of 585 new jobs.